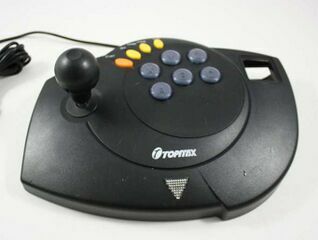 The Enforcer, by Topmax is a third-party Sega Dreamcast arcade stick. It came in at least six different colours; white, black, purple, blue, cyan and green. The Enforcer is a reasonably sturdy but fairly rare arcade stick, with a VMU port, six face buttons and a set of turbo features. Turbo works with every button bar and ( and ). It also has built-in vibration support. A PlayStation equivalent is known as the "Dominator".